I want to install Windows 8 in my PC, How to do it with the help of USB? Can you tell me the detail procedure of it? Which is the best way to install Windows 8 through Windows 8 ISO file installed in DVD or in USB stick? Re: How to install Windows 8 with the help of USB? How to do it? With latest release of Windows 8 developer version everyone started to experimenting it in and out of Windows 8 and its features and yes we can install Windows 8 through USB too and it needs some couple of software’s to be installed in your system with and you should have windows 7 installed before. STEP 1: Download the Microsoft Windows 8 Developer Preview image CLICK HERE!! 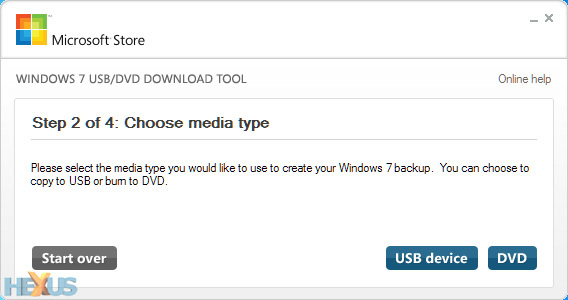 STEP 2: Download the Windows 7 USB/DVD download tool CLICK HERE!! STEP 3: Now format the pen drive to FAT32 file system. STEP 4: Open the Windows 7 USB/DVD Download tool once the format is done. STEP 5: Select the Windows 8 ISO file when it asks to select the ISO file. STEP 6: Next step it asks for the place to copy the content, select the USB drive where you have to copy Windows 8 setup. STEP 7: Restart your PC once the copy is done, and go to the BIOS by pressing F8/F12 according to the manufacturer. 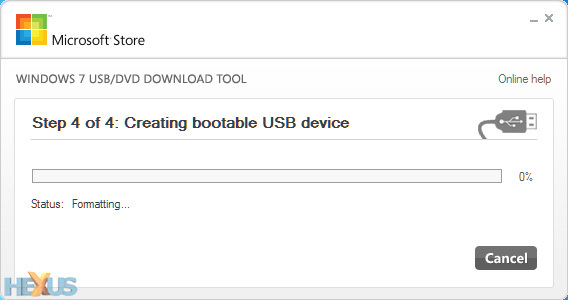 STEP 8: Go to Boot Configuration section and enable the USB Booting and make it as the primary preference. Save the setting and exit the BIOS. STEP 9: On restart the system will automatically boot through the pen drive and starts the Windows 8 installation. If you want to install windows 8 with the USB then you can go through the pendrive which consists of windows 8 OS in it and then you can install by using it but it may be the problem of installing while installing with the USB but you can do it by using CD or DVD of windows8 OS so that any of the file does not get missed. Friend, in order to Install Windows 8 by USB , you can do it by having Windows 8 Operating System dumped in it. You should connect USB to System and should boot the USB and it should be continued to be Boot. If you remove USB from the System, your Operating System would no more work. You can download a software tool which converts the ISO image into the bootable images. Then copy it in the USB drive. Now when you boot your PC connect the USB drive. and set the Boot by option from USB. After the installation will hapeen in the normal way. hello,that is so simple.You have to copy the windows 8 to the USB drive from the CD/DVD and then plug to the computer ,then restart and reboot your computer and then set boot option from USB .after that installation will take place normally. and completion of that you can us it . it does not matter which version of windows you want to install. if you want to install windows with the help of USB the you just need to change your boot device from CD drive to USB by making the changes in BIOS setting . The Release Preview is the final pre-release version of Windows 8 and is free to try, but if you want to put it through its paces without donating a blank DVD, here's a brief guide on how to easily install Windows 8 from a USB pen drive. Here's what you need: a USB pen drive (4GB or greater in size), the Windows 8 Consumer Preview disk image file (64-bit download here, 32-bit download here), Microsoft's Windows 7 USB tool (download here) and a working PC. 1. Install and run Microsoft's Windows 7 USB tool. In the subsequent window (pictured below), browse to the 32-bit or 64-bit Windows 8 disk image file you've already downloaded and hit next. 2. With your USB stick plugged in (remember, it'll need to be at least 4GB in size for a 64-bit install), choose USB device as your media type. 3. Select the correct removable device from the drop-down menu, then click begin copying. 4. Sit back, relax, and make a cuppa while the USB tool formats your pen drive, makes it bootable, and copies over all of the Windows 8 files. 5. Once the process is complete, the USB drive can be used to boot a PC and run the Windows 8 setup process. That's all there is to it. You'll save yourself a blank DVD, the Windows 8 setup process should be quicker from flash-based media, and it's of course a must on netbooks or laptops without an optical drive. Hello my friend ..first you need to download the iso file of windows 8 from here http://windows.microsoft.com/en-US/windows-8/iso. 1. Plug-in your USB flash drive to USB port and move all the contents from USB drive to a safe location on your system. 2. Open Command Prompt with admin rights. Use any of the below methods to open Command Prompt with admin rights. Type cmd in Start menu search box and hit Ctrl+ Shift+ Enter. Go to Start menu > All programs > Accessories, right click on Command Prompt and select Run as administrator. Next type LIST DISK command and note down the Disk number (ex: Disk 1) of your USB flash drive. In the below screenshot my Flash Drive Disk no is Disk 1. 4. Next type all the below commands one by one. Here I assume that your disk drive no is “Disk 1”.If you have Disk 2 as your USB flash drive then use Disk 2.Refer the above step to confirm it. 5. Next mount Windows 8 iso into a virtual drive by daemon tools and check the drive letter of the virtualdrive. In this guide I will assume that your virtual drive letter is “D” and USB drive letter is “H” (open my computer to know about it). D: CD BOOT and hit enter.Where “D” is your DVD drive letter. 7. Type another command given below to update the USB drive with BOOTMGR compatible code. Where “H” is your USB drive letter. Once you enter the above command you will see the below message. 8. Copy your Windows 8 iso contents to the USB flash drive. 9. Your USB drive is ready to boot and install Windows 8. Only thing you need to change the boot priority at the BIOS to USB from the HDD or CD ROM drive. I won’t explain it as it’s just the matter the changing the boot priority or enabling the USB boot option in the BIOS. well this can be only possible if you able to convert your Pen Drive in a Boot Mode. Then the next step is to copy window in a pen drive and connect into a PC. Wait for some time and follow the window procedure. Firstly, you need to create a bootable pendrive. You can now install windows from pen drive. Make an ISO image with the help of these software then you will successfully install window 8 in your PC. You need a bootable USB drive to install windows 8 from the USB drive. If you already have any lower version of OS installed on your computer then no need to make the USB drive bootable. You can install it easily same as any other software installation. You can make the USB drive bootable using your computer settings or using third party software. Download Windows 7 USB tool from the internet & install it. Launch the software-insert the pendrive in the USB port. Insert the windows 8 DVD or select the file from the storage. Browse & select the ISO file which you want to install. Wait until it finish all the process. After termination, restart your computer & change the boot option into "Boot from USB" option. Now you can install the windows 8 normally. You can install windows 8 through USB but you have to make your USB boot-able. Now your USB disk is a boot-able disk . Copy the windows 8 files and then your disk is ready to boot windows 8 to your computer. 1.Install and run Microsoft windows 7 USB tool.in the subsequent window, browser to the 32-bit or 64-bit windows 8 disk image file you've already download and hit next. 2. with your USB stick plugged in remember it will need to be at least 4GB pen drive.choose USB device as your media type. 3.select the correct removable device from the drop-down menu, then click begin copying. 4. sit back relax and make a cuppa while the USB tool formats your pen drive,makes it boo table and copies over all of the windows 8 files. 5.once the process is complete the USB drive can be used to boot a pc and run the windows 8 setup process. There are so many ways to install windows 8 operating system in your system! 2:After that, Copy entire windows 8 operating system files to the usb device including setup file! 3:After that, double click on the setup file which is in the widows 8 operating system! That's it! Very simple right? 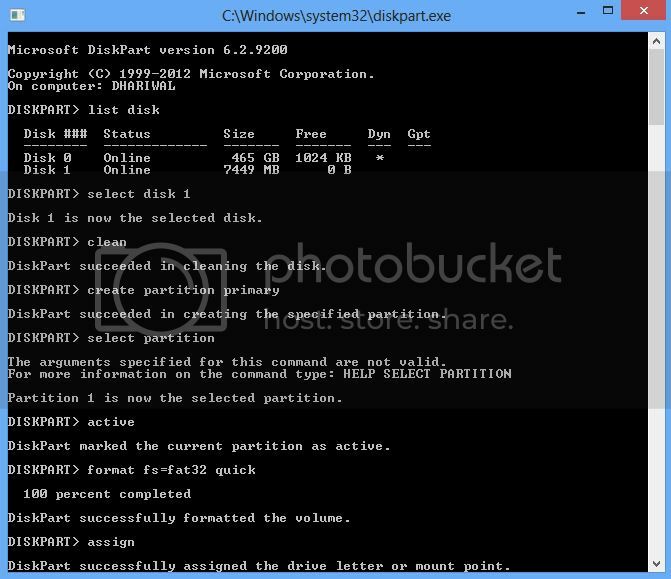 Installing windows 8 with boot able USB follow these steps. For these you can down load One soft ware that is Ultra ISO. It is converts ISO image file to Normal Operating system files. Next chose One Third party tool with Usb connector like Pendrve or etc. Next copy that total OS files including setup file into that Third party tool. Now you can connect with USB and click on that set up file for installing. Next we have to continue installation same process of like windows 7. If you want to Install Windows 8 through USB Pen Drive, then you will have to make your PEN Drive bootable. However, you may face many problem to make Pen Drive bootable. However, you may also Upgrade your Windows OS if you face much problem. Just insert the Pen Drive and start the setup of Windows 8. Follow the Instructions and start the setup. Your Windows will be upgraded to Windows 8. If you have a Windows 8 ISO file and want that on a flash drive, start with Step 2. If you have a Windows 8 DVD and need that on the flash drive, start with Step 1. 2. Download the Windows 7 USB/DVD Download Tool from Microsoft and then install it. This free program from Microsoft properly formats your flash drive and then copies the contents of the Windows 8 installation ISO file you have to that flash drive. 3. Start the Windows 7 USB DVD Download Tool program. 4. Click Browse and Choose ISO file screen. 5. Locate, and then select, your Windows 8 ISO file. Then click or touch Open. 6. Click or touch Next. 7. Choose USB device on the Step 2 of 4: Choose media type screen. 8. Insert USB device screen, choose from the drop-down box the flash drive or USB-connected external hard drive you want to put the Windows 8 setup files onto and then touch or click Begin copying. 9. 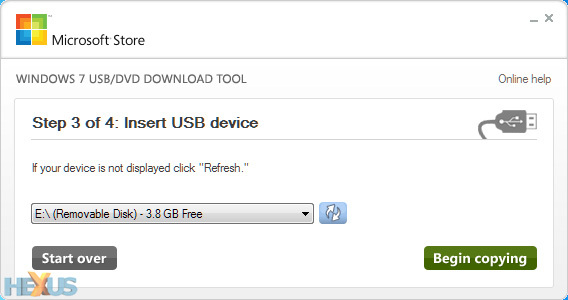 Click or touch Erase USB Device if you're prompted to do so on a Not Enough Free Space window. 10. Creating bootable USB device, just wait for the Windows 7 USB DVD Download Tool to prepare the drive and copy the Windows 8 installation files to it. Boot from the USB device that you just created to start the Windows 8 install process. Start the Windows 7 USB DVD Download Tool program. You should be able to find the shortcut on the Desktop, as well as in your Start menu or on your Start screen, depending on which version of Windows you installed the program on. 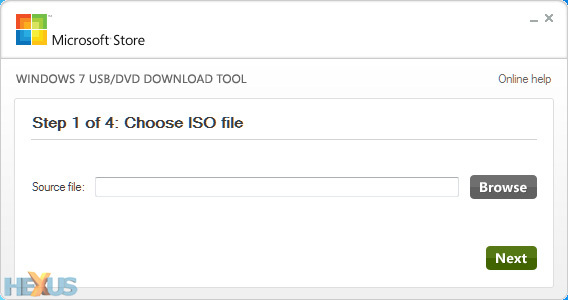 Click Browse on the Step 1 of 4: Choose ISO file screen. Locate, and then select, your Windows 8 ISO file. Then click or touch Open. Note: If you downloaded Windows 8 from Microsoft, check your Downloads folder or your Desktop for the ISO image. If you created an ISO image from your Windows 8 DVD, the ISO file will be wherever you created it to. Choose USB device on the Step 2 of 4: Choose media type screen. Note: As you can see here, there is also a DVD option. While it doesn't do us much good in this case, since the end game is to get Windows 8's setup files on a flash drive, you could also use this tool to burn a Windows 8 ISO image to a DVD or BD disc. On the Step 3 of 4: Insert USB device screen, choose from the drop-down box the flash drive or USB-connected external hard drive you want to put the Windows 8 setup files onto and then touch or click Begin copying. Tip: If you haven't yet plugged in the USB storage device you're planning on using, you can do that now and then touch or click the blue refresh button to make it show up in the list. Click or touch Erase USB Device if you're prompted to do so on a Not Enough Free Spacewindow. If you don't see this, don't worry, it just means that your flash drive or external hard disk is already empty. Important: If this message didn't make it apparent, you should know that whatever data you might have on this drive is going to be erased as part of the process of getting the Windows 8 setup files copied. On Step 4 of 4: Creating bootable USB device, just wait for the Windows 7 USB DVD Download Tool to prepare the drive and copy the Windows 8 installation files to it. The first Status you see will be Formatting, which will take anywhere from a few to several seconds, depending on how large the USB drive is that you're using. Next will beCopying files which could take anywhere from 15 to 30 minutes, possibly longer, depending on which Windows 8 ISO file you're working from, as well as on how fast your flash drive, USB connection, and computer is. Tip: Don't worry if the percentage indicator jumps ahead quickly but then sits on a single number for a very long time. While it might not make a lot of sense to behave that way, it doesn't necessarily mean anything is wrong. Assuming everything went as planned, the next screen should say Bootable USB device created successfully with a Status that says Backup completed. You can now close the Windows 7 USB DVD Download Tool program window. The flash drive, or other external USB drive you're using, now has the necessary files on it to install Windows 8 and is also properly configured to be booted from. if you have a windows 8 dvd just insert it in your dvd drive and then make a image file of this using nero burning rom in .ISO format. other option is just download "win2flash" from win2flash official website and then direct make a bootable pendrive from dvd. first copy all installation files from the DVD to a new folder in your computer then open win2flash and then insert your pendrive > give a path to the folder (which contain installation files of windows 8) > give path to pendrive > with till coping finished. >> You must Make Bootable USB Drive to Install Windows 8 From USB. So to Make the Bootable USB Drive you need to use the Software "Naivecorp win to Flash tool" to make Bootable USB Drive. >> Use this to make Bootable USB Drive. >> Now Plug in it into System. >> Press F8 for Bios Setting. >> Now Go to Boot Priority and Select USB Drive Priority First. >> Press F10 and Save Changes. >> Now you can Boot the Windows 8 and install it from USB Drive. >> After that Follow the Steps of Installing Windows 8. By using newest turmoil Windows 8 creator edition absolutely everyone began to experimenting the idea in and out of Windows 8 as well as onpar gps and yes you can install Windows 8 by way of USB as well as well as it a few couple of software's to generally be put in within your body using as well as you ought to have windows 7 put in before.Now follow your listed below actions to run Windows 8 with the help of USB generate, 1: Obtain your 'microsoft' Windows 8 Developer Survey graphic CLICK HERE!! 2: Obtain your Windows 7 USB/DVD acquire resource CLICK HERE!! 3: Now format your pencil generate in order to FAT32 file system. 4: Start your Windows 7 USB/DVD Obtain resource in the event the structure is actually done. 5: Pick the Windows 8 ISO file gets hotter demands in order to simply find the ISO file. 6: Next thing the idea asks for the spot copying this article, simply find the USB generate exactly where you have to content Windows 8 set up 7: System ones PC in the event the content is done, as well as see a BIOS by simply important F8/F12 good manufacturer. 8: Head over to Trunk Settings sections as well as give the USB Booting to make being the primary preference. Help save your establishing as well as quit your BIOS. 9: In system the unit will certainly immediately boot with the pencil generate as well as begins your Windows 8 installation. First you have to create Your usb bootable with windows 8 . This will be done by Power ISO software . After you have to change the boot option from CD/DVD to boot from USB first . Your Boot will start from usb ..
To Install WIN 8 from USB youneed to create a Bootable USB drive. 2--Download the Windows 7 USB/DVD Download Tool from Microsoftand then install it. 3-- Startthe Windows 7 USB DVD Download Tool program. 6--After successfull instalation "backup complete" will be displayed..
8--Now restart the system and boot via USB..
You can find Windows 7 USB/DVD download tool at the official Microsoft website you will get all instruction for creating a bootable DVD or USB drive with this tool. First you just download this tool and along with the ISO file copied onto the DVD/USB drive, run this tool. You can create bootable Disk with this tool. At the next time system boots, enter the BIOS and set the boot device priority first to DVD/USB. You want to know How to install Windows 8 with the help of USB? How to do it? you have to create USB Bootable . To do this you have to install first of all PowerISO Software tool to your system . This will available free on FileHippo.com . Download the latest version and Install it on to your system . Then Open Power ISO . Now you have to Select Source image File. And click On Start Button . Your USB Drive will be start Bootable ..